TRIVIA of Noh : Q90 : Does the Noh stage have a flat surface? | Home | Trivia | Q90 : Does the Noh stage have a flat surface? Does the Noh stage have a flat surface? With a floor, pillars, walls, roof and a bridge, the stage in a Noh theatre includes many features of a building. Therefore, it may be natural for the audience to assume that the stage has a flat surface. In fact, however, the stage has a slight incline. The main stage descends slightly toward the auditorium. The incline gives the audience in front of the stage a good view of the actors' foot movements. 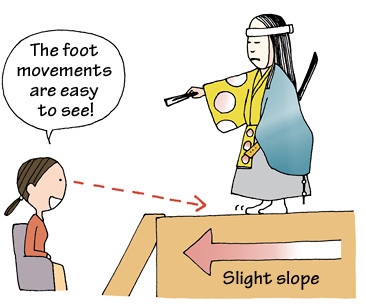 The sloped stage structure is called bachi-korobashi (rolling of a drumstick), as the gradient allows a drumstick placed upstage to roll at a uniform rate until it reaches the front end. The bridgeway also has a slope, which ascends gently toward the main stage. Actors feel a slight resistance at their feet during their entrances, and they can proceed smoothly when they exit. This helps create the ambience for their arrivals and departures. The gradient of the bridgeway ascending to the Noh stage has been standard since the early modern era; in olden times, it descended toward the stage.